Animated GIFs, when open through the gallery app in Android are not animated. Static gifs are displayed when you try to open them via Android Gallery. This creates a problem if you saved up some animated GIFs from the internet and want them to play in your phone. There are several methods using which you can play or view animated GIFs properly in Android. This post tries to list a few of those. Google Photos app or simply photos app is now a part of Android. Using this app, you can manage Google+ photos, albums and videos. This app is also useful for viewing locally stored pictures. This app acts as an alternative to the Gallery app. When you open animated GIFs via this app, they open normally and are played by the app. But you might have a hard time locating those image files in this app. This application mashes up photos from Google Plus as well as your offline photos. Just make sure that you are in the "All" tab of this app and scroll around to find your animated gif file. Did you know that you can easily open locally stored files using your internet browser like Chrome or Firefox? You just need to know how to navigate to your file. 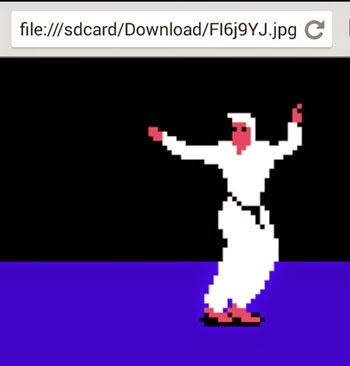 Using the same method you can play animated gifs in your browser, quickly and painlessly. Just make sure to type "file:///sdcard/" without the quotes in your Chrome browser. In Firefox, you can begin from "file:///", also without the quotes. Then navigate through folders to reach your animated file and tap it to open. If you know the entire path to your animated gif file, you can directly type a path like "file:///sdcard/Download/animate.gif" in the address bar of your browser(s). You can also install dedicated apps like "Animated Gif Player". Using this app, you will be able to play animated gif files with ease. Just use the app to navigate to your gif file and the integrated browser will play the animation smoothly. This app also has additional features like a gallery of online animated gif files which you can watch for fun. Chances are that you already have this file explorer app present in your phone. Using this file manager app, you can browse files to reach your animated gif file. Then tap on it and it will display an option asking you to select an app to open the gif file. You can choose ES Image Browser which is capable of handling animated gifs.